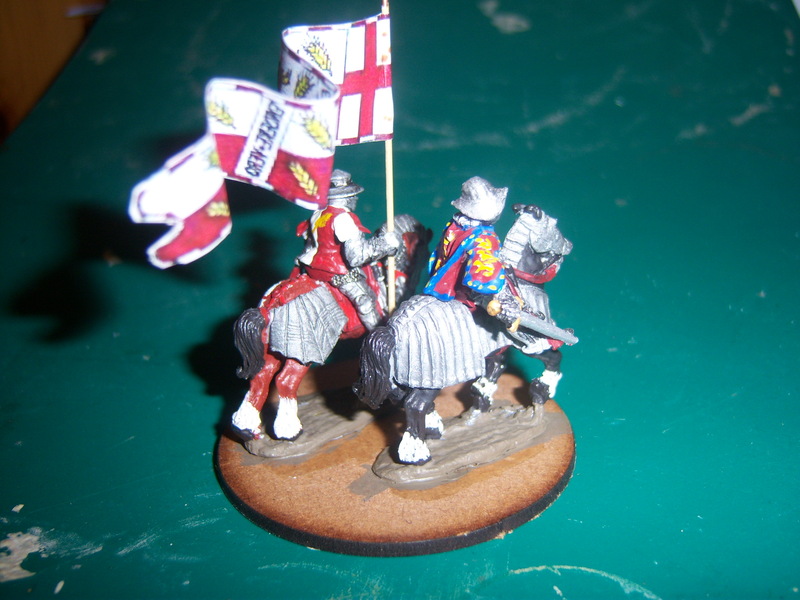 I have to admit that I have finally had enough painting War of the Roses figures. 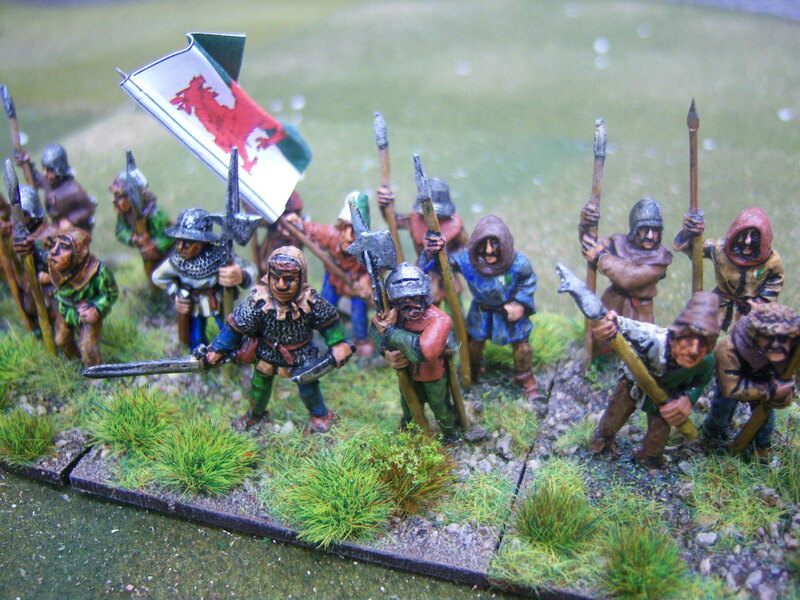 In the last month I have painted and based over a 100 figures. So to forget it all on Saturday myself and Nathan had a game of AWI. This was the first AWI game for Nathan. 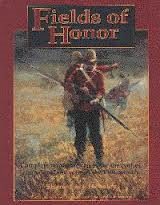 We used Field of Honor war game rules with a few house rules. We allocate a playing card to each Commander and one for the end of the turn. Plus a few others which I will detail if interested in a later blog. These were basically what ever I had on the shelf. AWI is a new period for me so I do not have too much, yet! 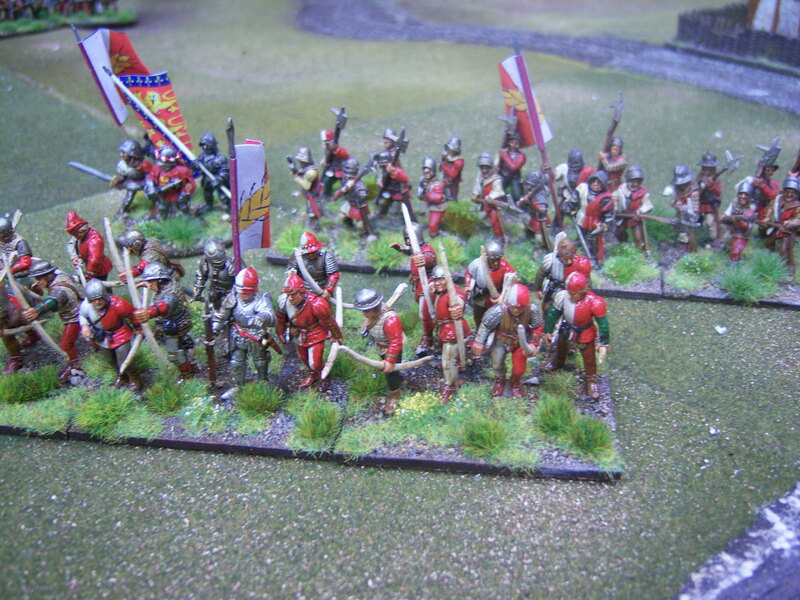 Brigade commander No2 had 2 Battalions of State Militia and a unit of Continental dragoons. 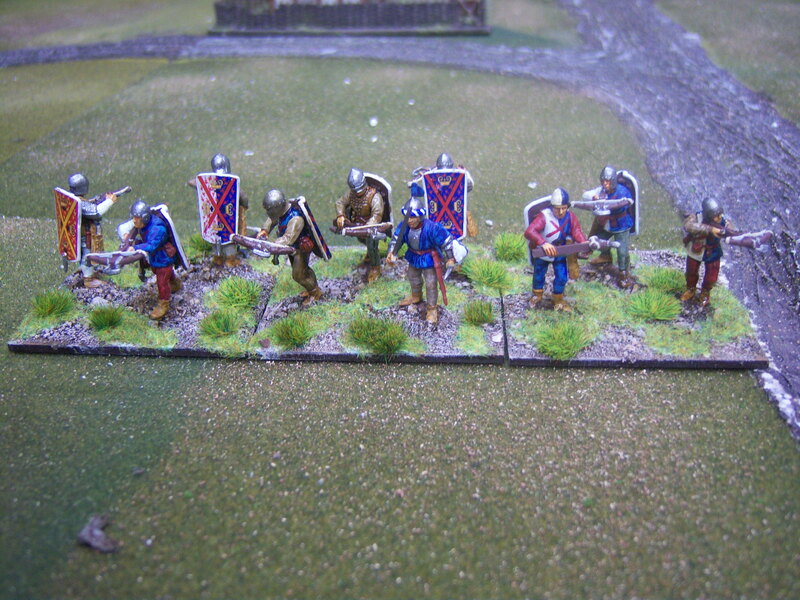 Brigade commander No2 had 3 Battalion of line and 1 light infantry company( skirmishers). If you can call it one was a meeting engagement. I threw down some terrain boards, lined the roads with Picket fence, A plantation house and some trees. 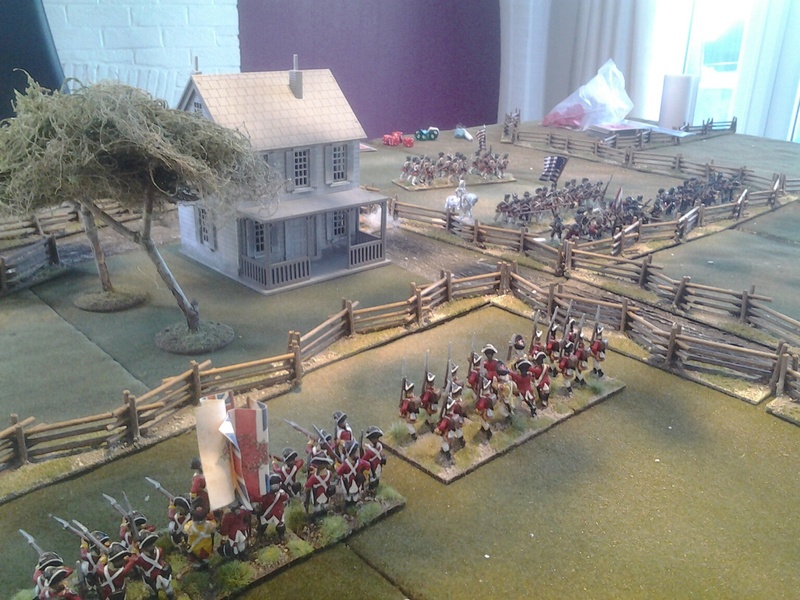 Both sides deployed and………………..
Brit No.2 commander is drawn – All units deployed to the left of the road with the light infantry company racing out in front having spotted a brigade of Americans through the trees. 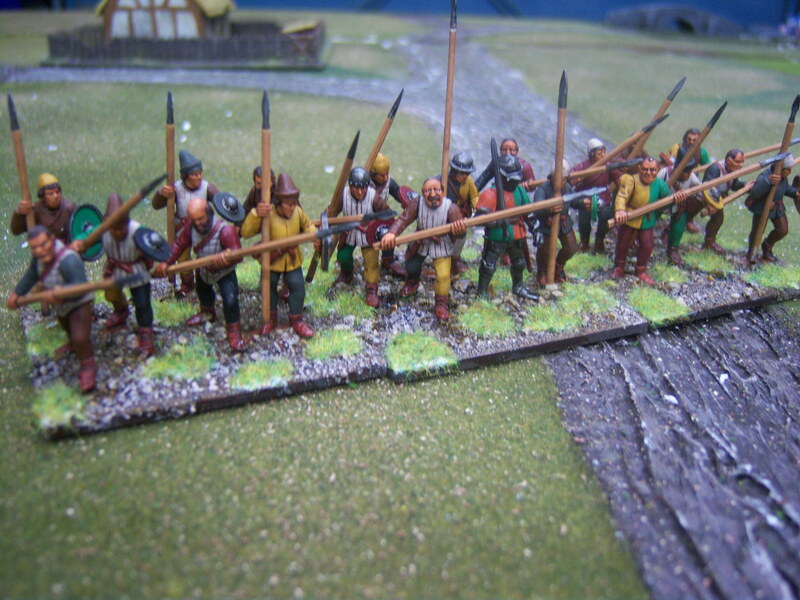 Brit No 1 commander is drawn – Units deploy to the right hand side of the road. American No.1 commander starts to deploy troops to the left of the road. American No.2 commander started to march his troop along the connecting road. American CinC – With his command range he manages to reactivate both junior commands. 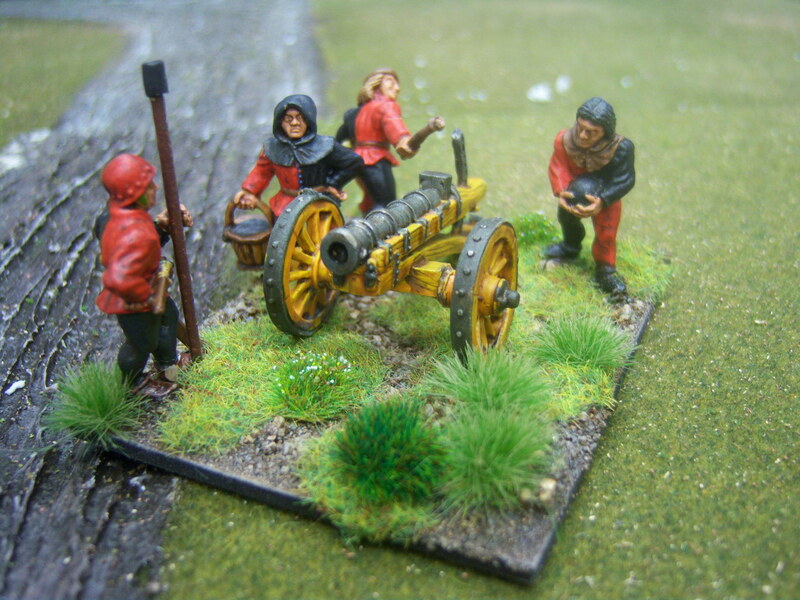 They carry on as before except the artillery which deployed last move decides to fire at the Grenadiers. 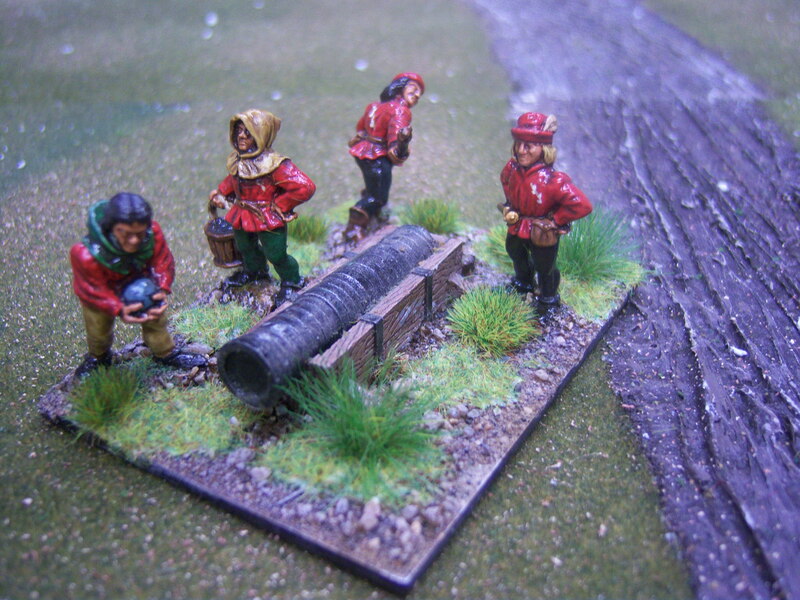 They roll 3 D10 needing a score of 7 to hit (Base score is a 5 to hit but -1 off the die for Smoothbore artillery and another -1 for the long range ( 38″)). I rolled 2/8/9. Therefore two possible hits. Nathan needs a 5+ to save, he rolls a 2 + 2 A class =4 =Casualty and a 5 +2=7= saved. End of turn card – All units that have not been activated may fire. 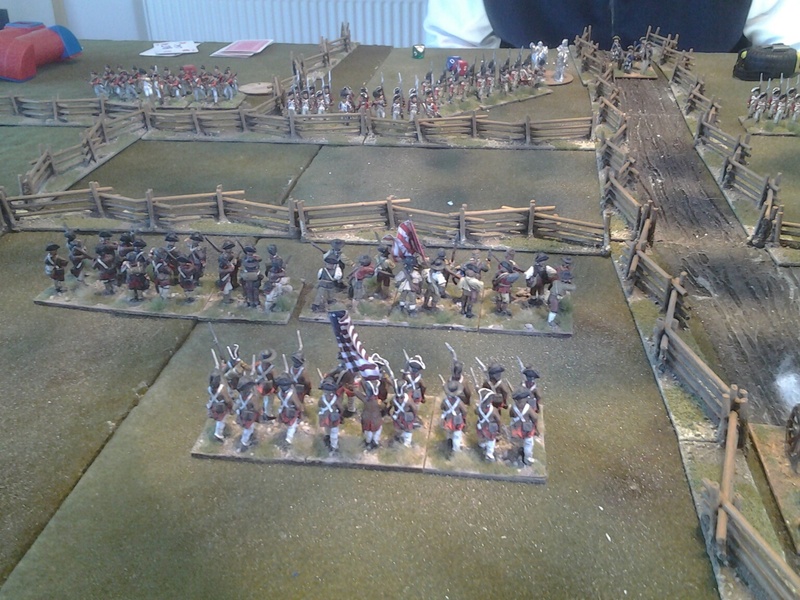 American commander 1 is drawn and this enable his 2 lead units to advance up to the fence. 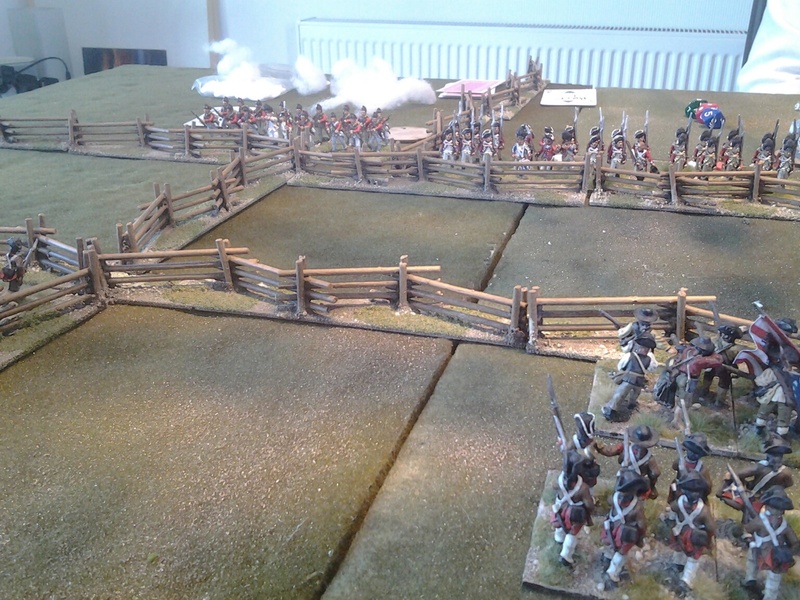 Artillery fires again at the Grenadiers but no effect this time. 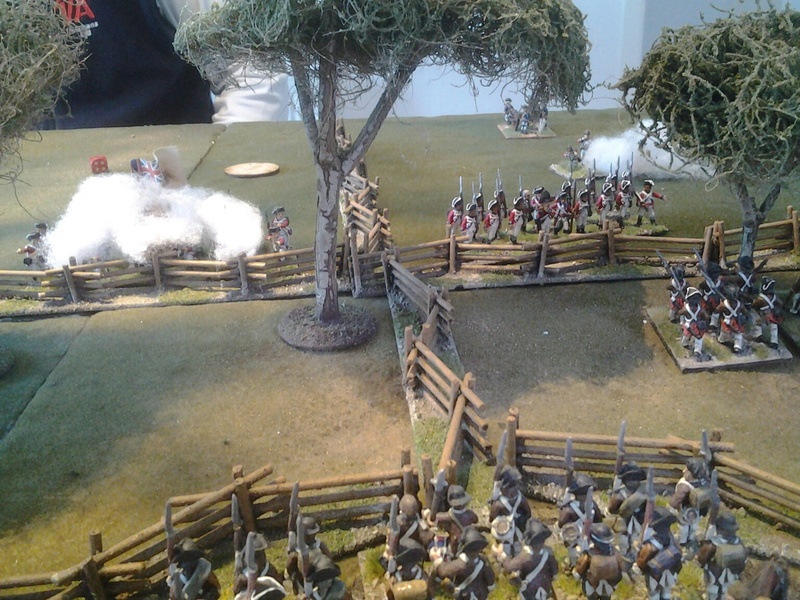 British Commander 2 light infantry company advance a take a shot at the continental dragoons. 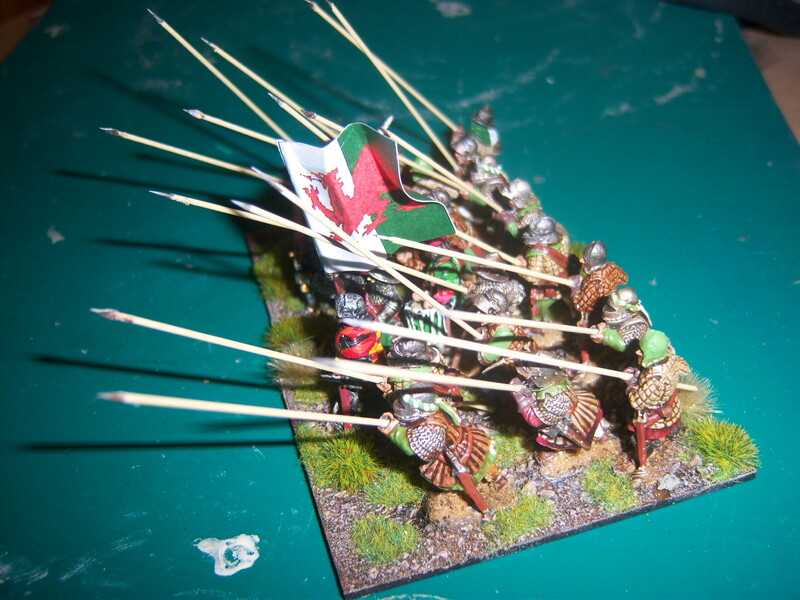 ( House rule – Skirmishers can make a half move and fire). 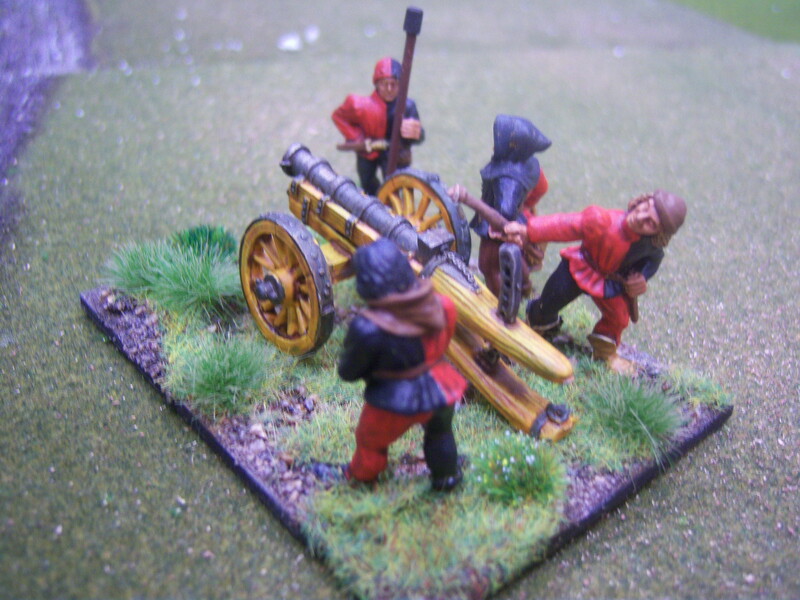 They inflict a casualty on the dragoons. American CinC He allows the commander 1’s infantry now lining the picket fence to fire at the line and grenadiers. 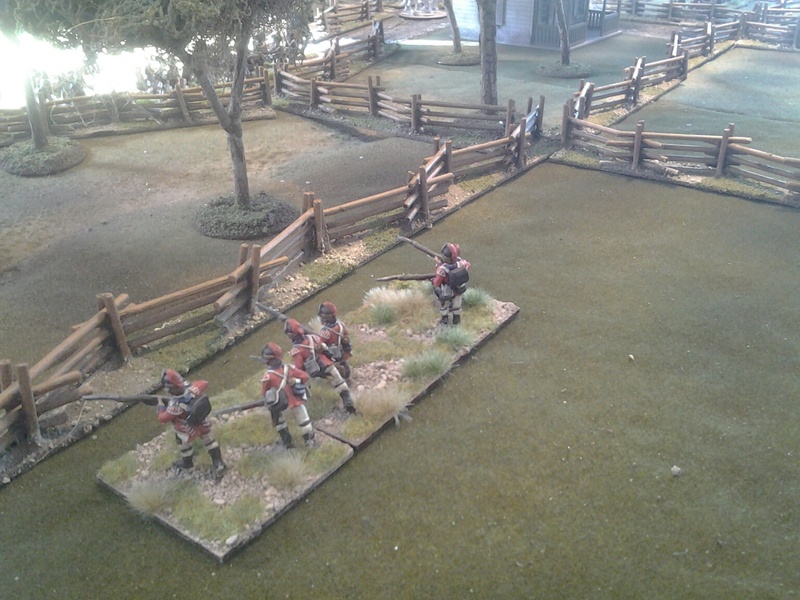 The State militia manage to inflict a casualty on the line and an even better surprise was the two hits inflicted upon the grenadiers by the Green militia. Unfortunately for me, Nathan managed to save one of them and avoid losing completely the grenadier battalion. This certainly made him nervous. there was a counter artillery fire where a casualty was inflicted on the British crew. 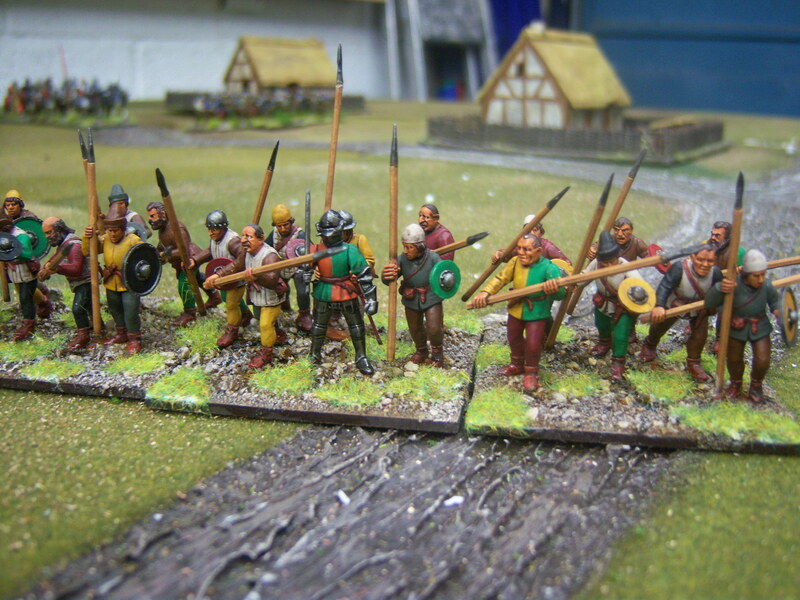 This reduced them to two strength points but more importantly meant they could only roll two dice in attack. American commander no.2 is in command range of the C in C so he gets all his units to right turn. 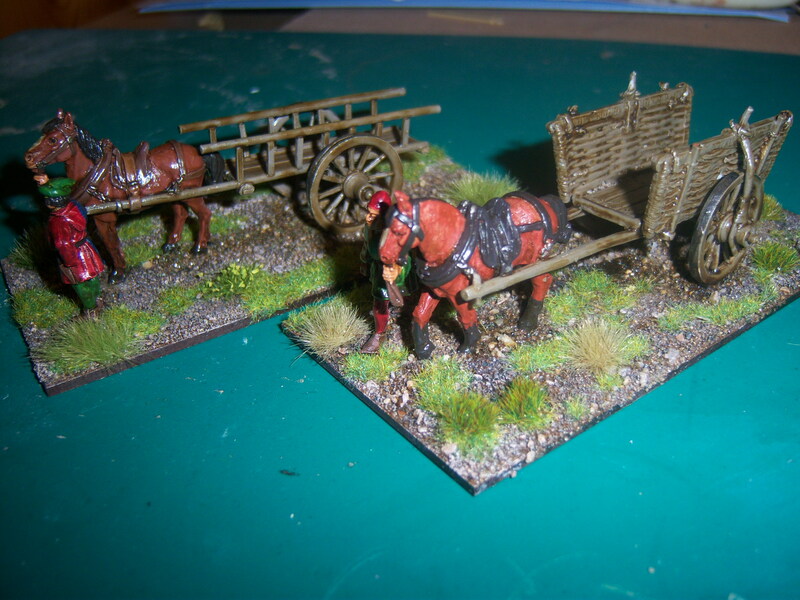 This enable the infantry to have soft cover from the fence and enable the cavalry to think about chasing off the annoying skirmishers. End of Turn – All units that have not been activated may fire. British right wing (No.1 have a fire but not a single hit. American C in C – I unleash all the fury my side can muster. Unfortunately with no damage. 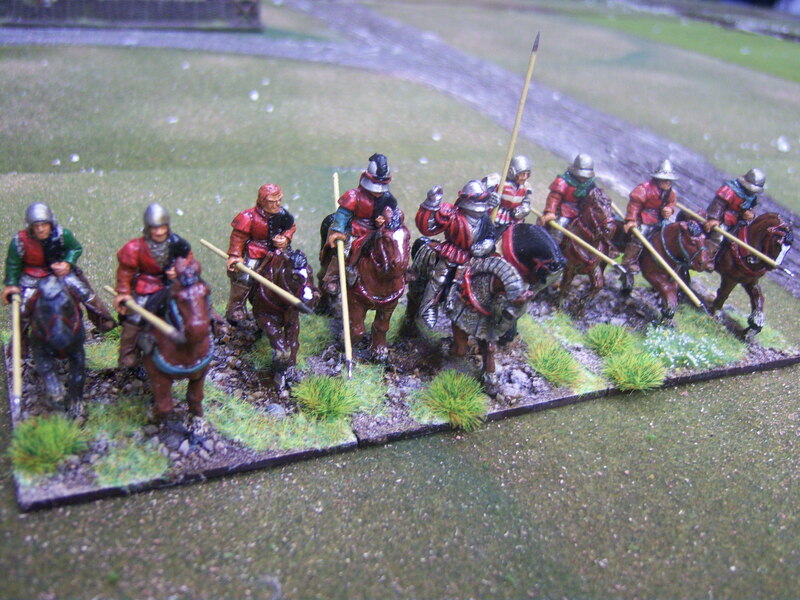 I roll a D6 for the Dragoons to clear the fence and the lose 6 ” of movement so they move 2″ in total. 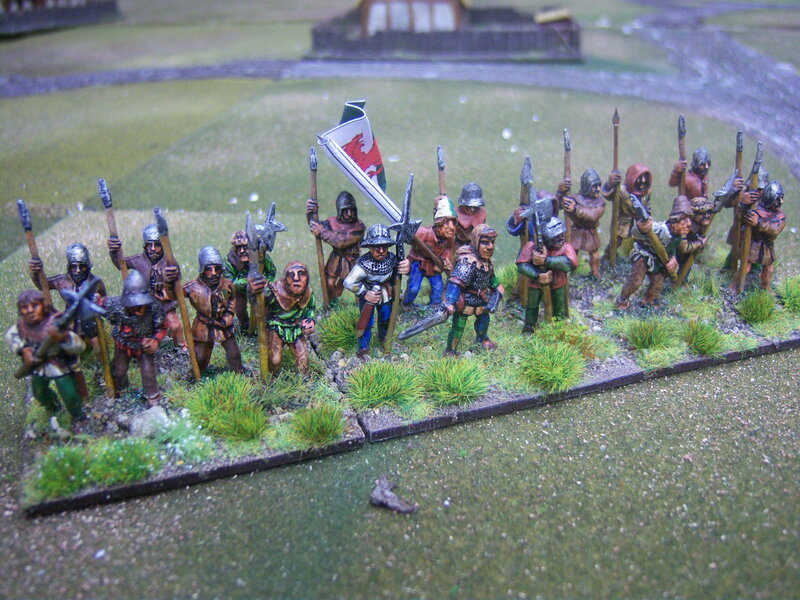 A state regiment sent to support the dragoons only lose 1″ and so move 5″ towards the British left flank. 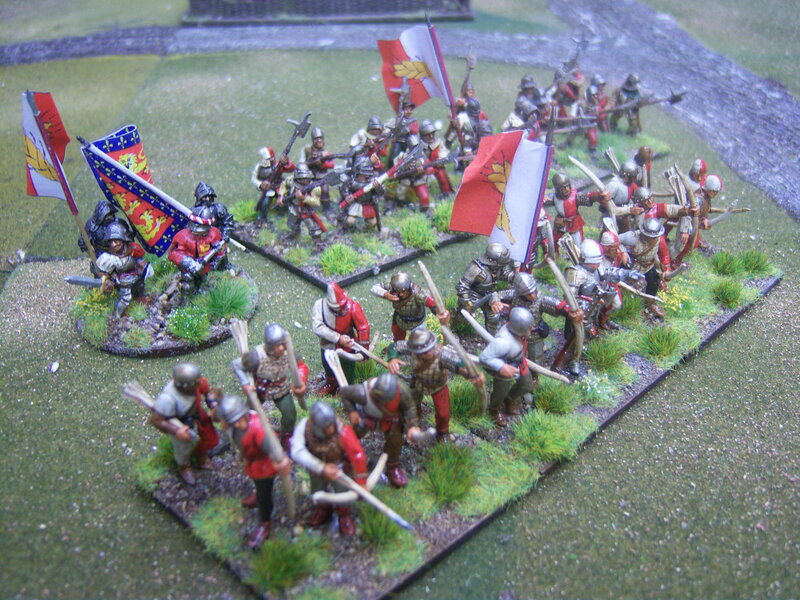 End of turn – The British right inflict a casualty on each unit with the centre left taking two and me not saving any. They are removed from play. I have to admit that I do not feel so sure of a victory. 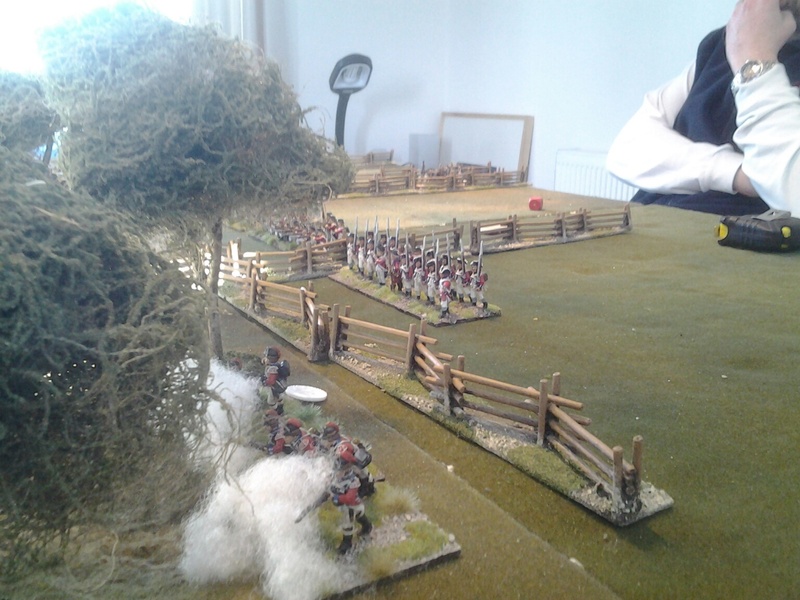 The British skirmishers inflict another casualty on the dragoons and the artillery hit the American artillery causing a single casualty. American left with a gap! Another three turns and it was all over. 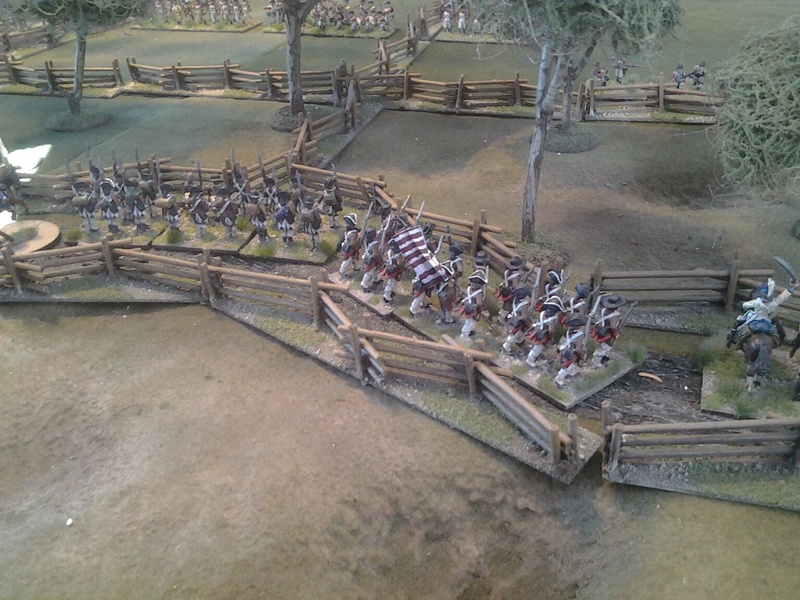 I retreated my troops from the field leaving the British in charge. 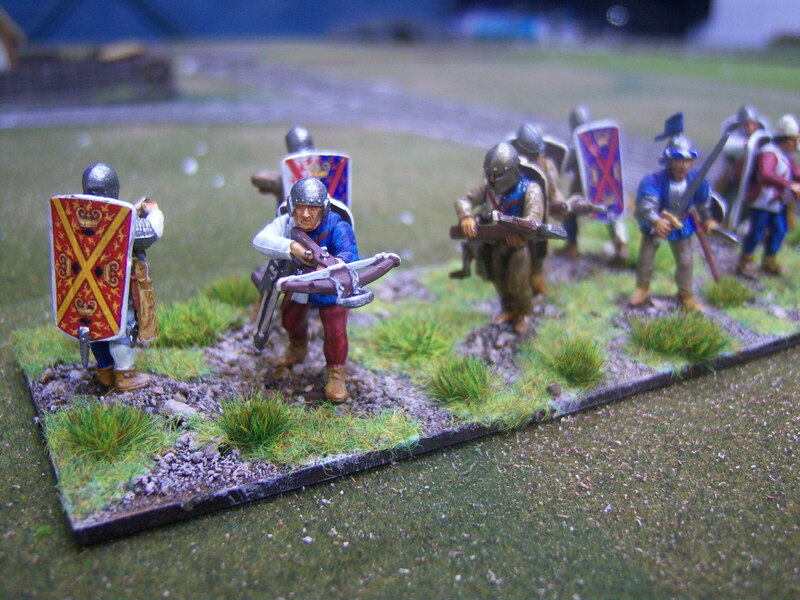 I had ended up losing my dragoons, artillery and a state militia unit while the British only lost their artillery. A fantastic time was had by all. 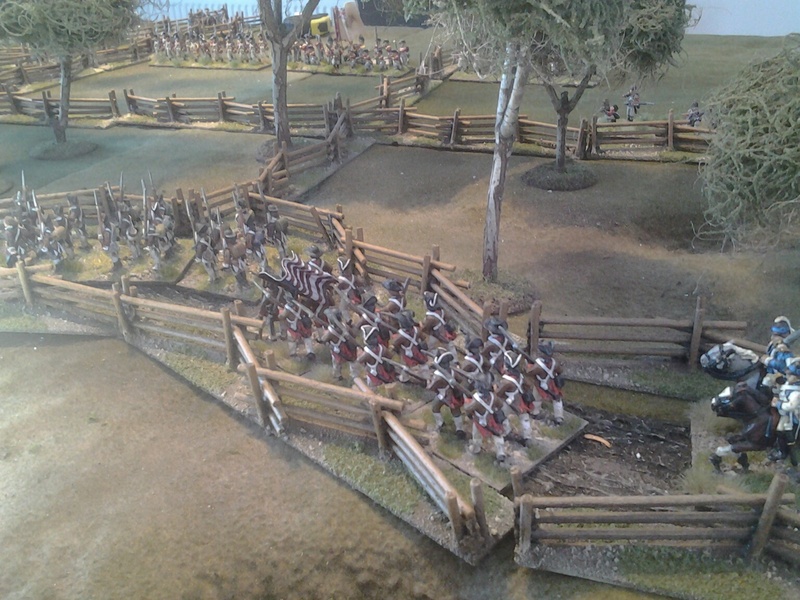 The ebb and flow of the battle was great and we thought very realistic. Rules played ideally and we will probably borrow the morale and charge rules from the bigger 19th century version. Nathan had the rules off to a tee with in two turns. Both agreed that they will be ideal for the bigger games we would like to put on. It also meant that as we sat and reviewed the 19th Century version and spotted the ACW I think it may be an era I may go back into again for the 3rd time!!!!!!! Figures are from my collection and are Foundry and Perry. Fencing is from Treefella on ebay. Great value if you don’t have time to spare to make it yourself. The plantation house was from Arcane Scenery and Models. Great model that goes together well. Like most pleasures there is now a period of guilt! Back to the War of the Roses. For this show which is my local I was hoping to put on a war of the Roses Game. In fact I had decided to try and do Bosworth. As the show is now only a few months away I have taken stock of where I am. I have to admit I am a long way off having all the troops ready. Too distracted with other eras and a new job. With this in mind I am working on a slightly different approach and intend to do an encounter game. it will probably involve most of the troops I have. 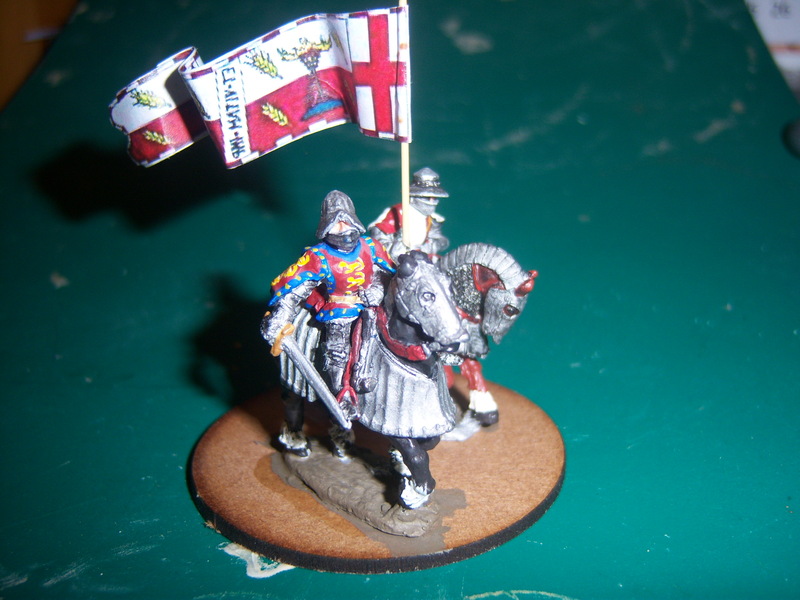 Below are a few shoots of the stuff I have painted over the last month or so. 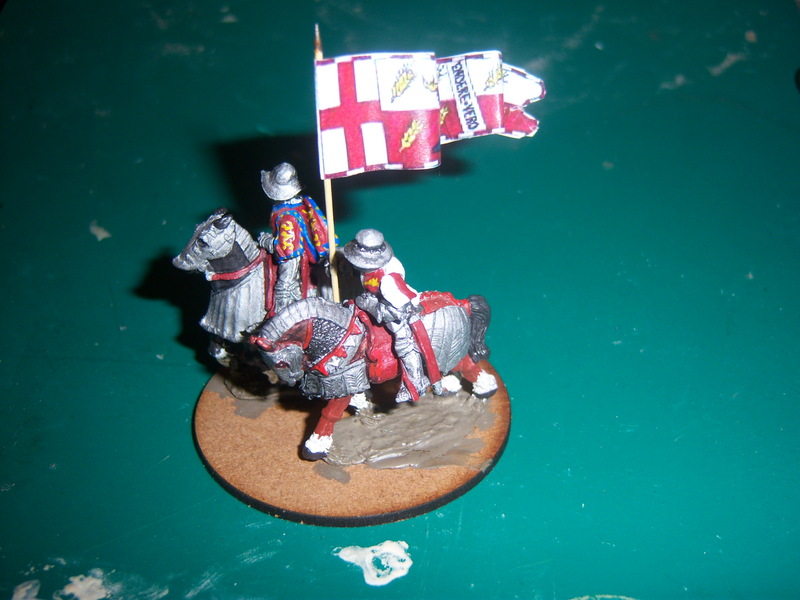 Henry Holland, 3rd Duke of Exeter (27 June 1430 – September 1475), As an Exeter boy myself born and breed, I just had to have a battle representing him. 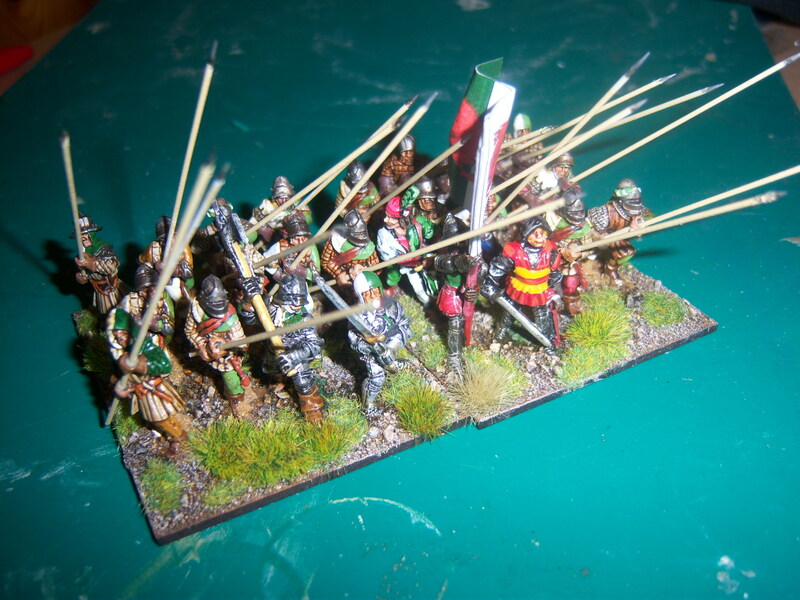 I currently have a small command base on foot, mounted to come, 1 unit of bills and another of Archers. this will probably increase to 2 of archers. Command – Foundry. these are smaller in height when compared to the others so put each figure on a small base to lift them up then hid it with the textured base. 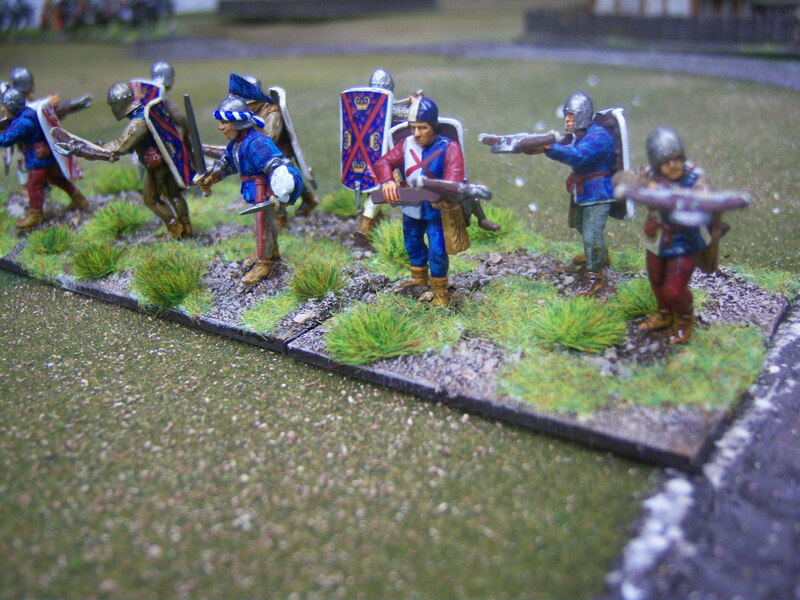 all of my units are made up of 3 bases 60mm x 60mm. These have been sat on the paint table for about a year half finished. I might stick a few arrows in to the pavaises and surrounding ground for dramatic effect. Never done so much Wargaming! Sorry it has been a while but I have been distracted. My normal wargaming life is to pick a scenario and over the following year, write the rules, collect the figures and build the terrain. Once done, I usually take it to a couple of shows and play the game with a small group of close mates. We might even get together a couple of times through the year to try it out. When purchasing a few item from a well know web site I noticed the seller offered free collection and being only a mile down the road I collected them. What a surprise. 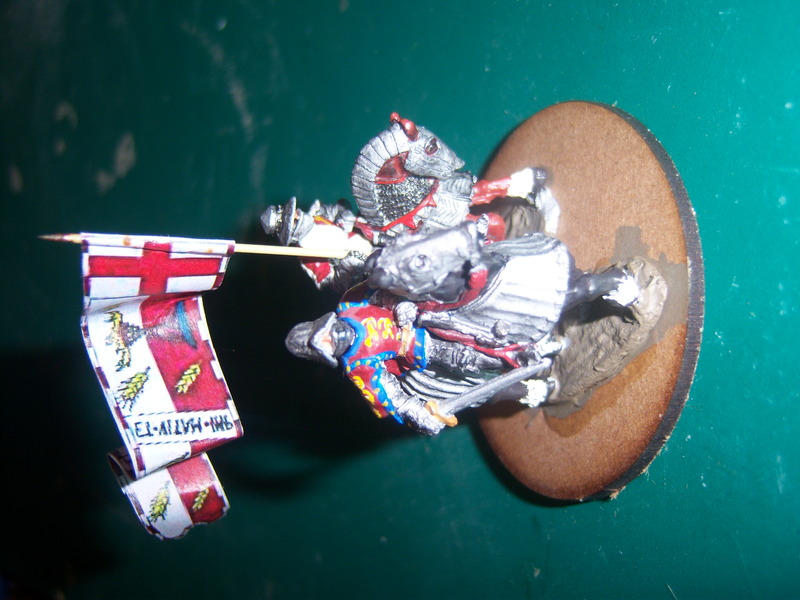 The seller turned out to be a wargamer (Nathan) I knew from a few years back Anyway the upshot is that I am now wargaming more than ever, unfortunately this has had an impact upon the painting. This was bought for me by wife for my birthday. I have now had my first game and have to confess I loved it. We only played with 1 ship each and with the basic rules but I have to admit it was perfect for a naval game. I enjoy the thought of naval battles but in the past have not had a great experience having played for a few hours and still awaiting the ships to get to grips. Next time we will either add an extra ship or try out the additional rules. The last show I went to, Devizes I bought 4 additional ships. These are frigates aimed at the American war of 1812. Looking at the deck for some of them it should be fast and furious. I think these are a great set of rules. I have both versions. 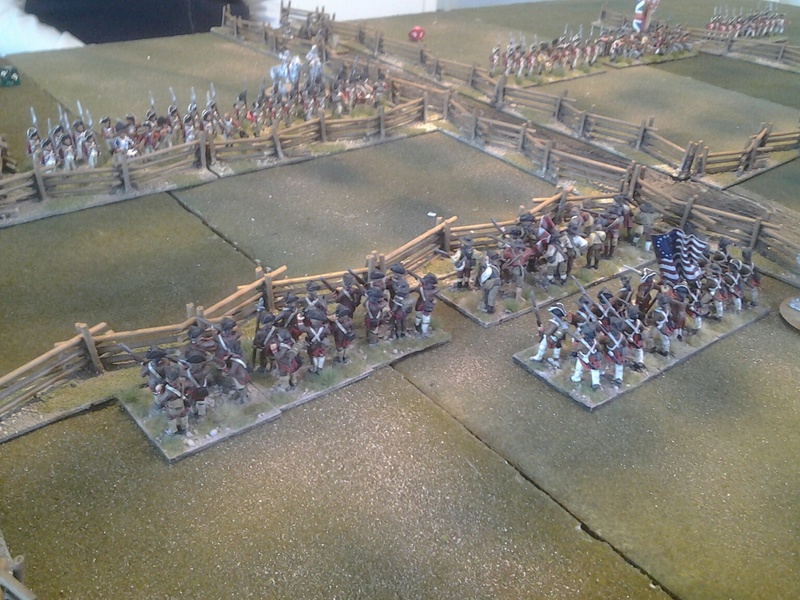 The set we played with was the American War of Independence set. These are a booklet in reality, but come with some maps and counters enabling either use with figures or as a board game. There is also a campaign offered. Nathan have never played them so I set up the maps and we played a randomly generated game and played the rules straight out the book. It worked well and we both agreed that using these rules for the tabletop will be ideal, especially as the full set offer a little more detail without over complicating the basic rules. This is a board game I bought at the Plymouth Show (PAW). Great show please check it out. Freeman’s Farm and Lundy’s Lane were turning points in the American Revolution and the War of 1812 for America in the formation the United States Army. I picked this up purely for the artwork. You get two maps, 4 decks of action cards and full colour counters. Thought I could use it to identify and build additional units for each era. The game played well but not probably something we will play again. This month I also decided that WW2-28mm is probably not for me and so I sold all the buildings I had as well as most of my “I will get around to paint them” pile of figures. The buildings were all from the Grand Manner Carentan range and used in my Dad’s Army game. Nathan also does War of the Roses re-enactment. During an evening chat as we played we discussed the War of the Roses. It fired me up to focus some attention on to this forgotten period, again. 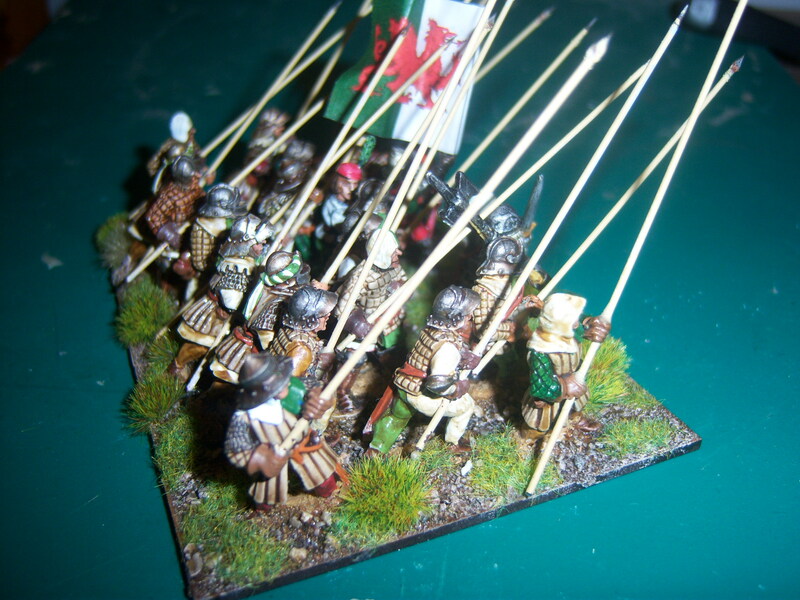 Having looked at the pitiful collection I had I looked around and have decided to reinvest the funds from the sale into a collection suitable for Bosworth. 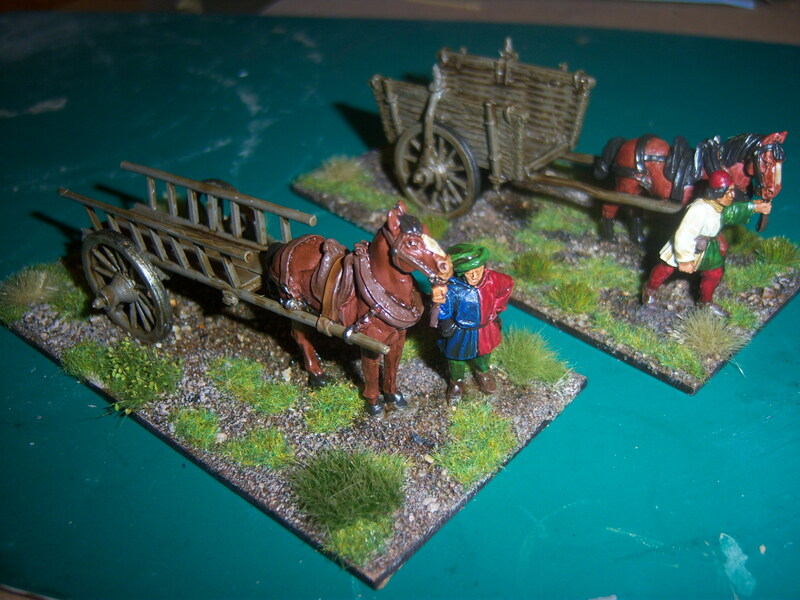 Initially these will be based around the scenario in The Flower of Chivalry rules from the Canadian Wargames Group. Below is the structure of the units. 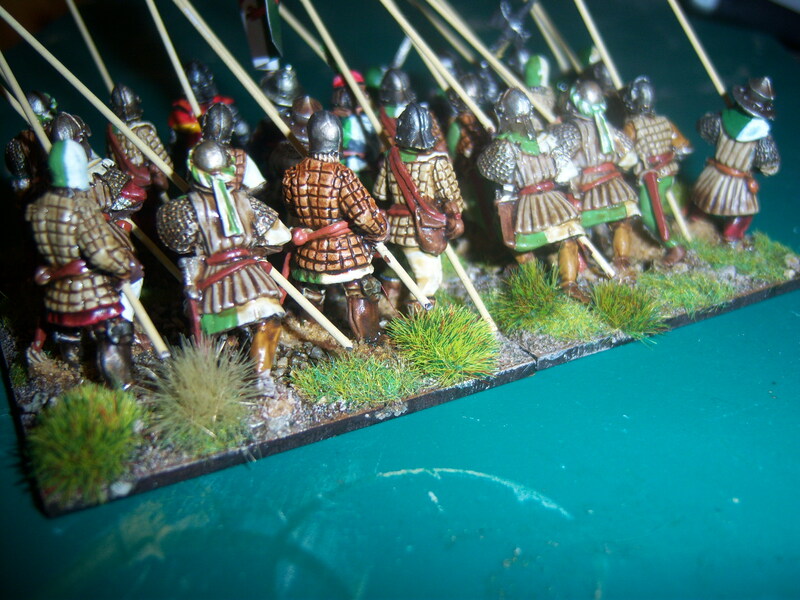 So at the moment I am trying to add units to 3 eras while also playing more wargames than I have for years. 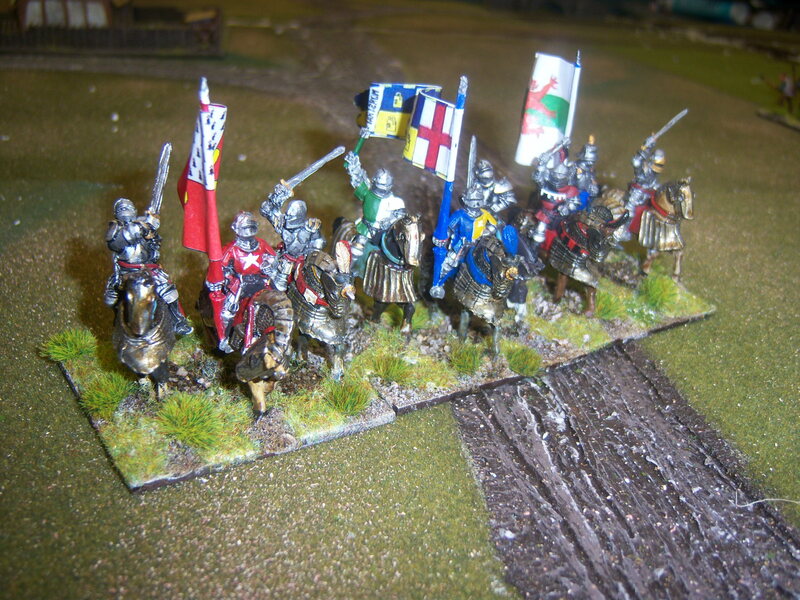 Next week we are going to try out a couple of War of the Roses scenarios.